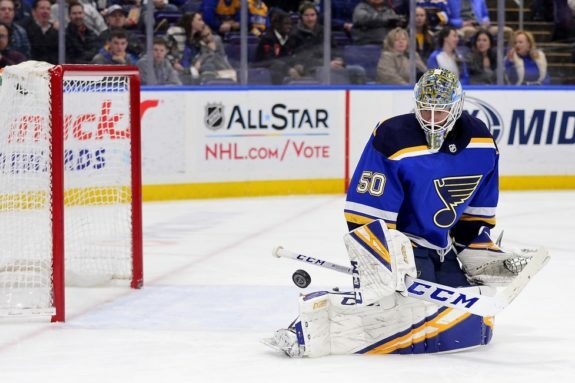 ST. LOUIS — Oskar Sundqvist had a goal and an assist and rookie Jordan Binnington made 28 saves to lead the St. Louis Blues to a 4-1 win over the Montreal Canadiens on Thursday night. Robert Thomas, Jay Bouwmeester and Sammy Blais also scored for St. Louis, which won for the second time in its last six home games. Sundqvist buried a feed from O’Reilly for his eighth goal of the season to extend the St. Louis lead. Bouwmeester put the Blues ahead 3-0 when he skated in front of the defence and converted a feed from Robby Fabbri 6:04 into the second period. NOTES: Blues D Carl Gunnarsson recorded his 100th career assist on Sundqvist’s goal. … RW David Perron has registered at least one point in his last nine games. … Canadiens D Karl Alzner skated in his first NHL game since Nov. 24. He had been a healthy scratch for seven games since being recalled from the Laval Rocket of the AHL.